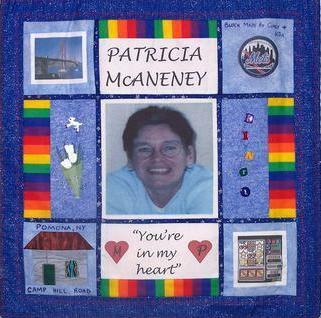 In the months following the attacks of September 11, 2011, quilters joined together to create memorial quilt squares that paid tribute to each victim. Each quilter created a block in honor of a specific victim, and the blocks were combined to create a large memorial quilt. Some blocks included a photo of the victim, some included references to hobbies, and some simply listed the victim’s name. One of the things I find most touching about the quilt blocks is that they highlight that these were individuals who perished. Thousands of them. They were not simply a group of anonymous victims. This entry was posted in Legacy.com Remembers, Photos @Legacy.com and tagged 9/11, Life at Legacy.com, Obituaries, Photos, September 11, Tributes. Bookmark the permalink.